I think one of the best things I ever did to save money was to buy a chest freezer. It might sound a bit crazy to suggest spending $200 to $500 on a chest freezer in order to save money on food. After all, your refrigerator already has a freezer. Why do you need a second one? The answer is simple: You can purchase frozen foods in bulk, and you can also purchase a large quantity of items that you find on sale. 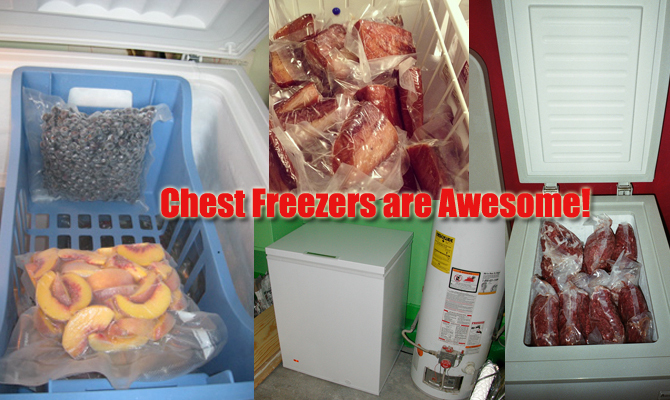 Chest freezers allow you to purchase sale items in large quantities. They also help to ensure that there will always be something in the house to eat! I purchased mine 11 years ago, and have never once regretted it. #1 Keep your eye open for sales on meat products and your favorite foods (that can be frozen). When you see sale prices that are rare, purchase a large amount. Consider purchasing an extra turkey after Christmas when turkeys are on clearance. If chicken breasts or wings hit less than $1.00 a pound, grab a ton. If you know it is a good deal, then jump on it. #2 Visit a butcher shop once a month. Instead of buying meat at the grocery store (which is a convenience) consider going to the butcher and fish market once a month. Have these items wrapped and labeled well, to prevent waste and mystery meals. You can cut your grocery meal by 20% or more. #3 Purchase large quantities of other items that you would not typically consider freezing. Things like bread, milk, fresh fruit, pastries, and vegetables can also be frozen and used later. For example, when bananas are on sale, I like to remove the peels and freeze them in Ziploc bags in a special container. I then use them in my fruit smoothies. If I can get wheat bread for $1, you had better believe I will buy 10 loaves, and freeze 8 of them. They will make great French toast, regular toast, and grilled cheese sandwiches later! #4 Keep water jugs (old milk containers filled with water) to put in your freezer if it becomes half or completely empty. A full freezer works more efficiently, uses less electricity, and lasts longer as well. An empty freezer has to work much harder to keep the temperature regulated. #5 Invest in large freezer-safe containers to keep your food items organized. Without freezer food storage containers and proper organization, items can end up stuck at the bottom of the freezer and you’ll forget you even have them. #6 Avoid freezer burn by paying attention to how to store food in the freezer. Plus, flash freezing will give you access to small portions for your cooking needs. Is A Deep Freezer Worth It? Should I Get A Chest Freezer Or Not?